Let’s flash back to 203 days ago. Just beginning this impossible project, I really had no idea what I was getting myself into. But that didn’t stop me from realizing that I couldn’t waste time on picking records. I needed an album for Day 3, and I decided to check where I found most of my music pre-Swole. Back then, my last.fm homepage gave me some pretty solid recommendations—this was before I had completely ruined the algorithm by breaking my listening habits and playing music of every variety under the sun. Swole Ear may have significantly broadened my musical horizons, but it has also significantly effected my musical recommendations. Last.fm, I’ve had enough under-produced folk-punk for now, thank you very much. 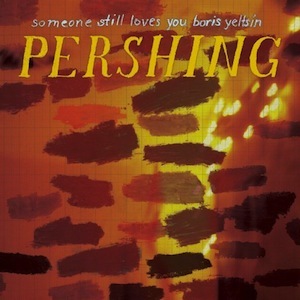 Anyway, I saw a band on the list called Someone Still Loves You Boris Yeltsin. How could I not check them out? It’s been love ever since. I’ve listened to Broom a million times over the past seven or so months. Today, I decided that I wanted to hear more, so I listened to the group’s second album, Pershing. I was not disappointed—there was no sophomore slump for SSLYBY. Yes, the band still sounds exactly like Wilco, but I’m willing to overlook some statements that I’ve made in the past 203 days regarding my dislike of non-innovative bands. There’s no denying that this is some good alt-country, regardless of whom they may be influenced by. Plus, this is Swole Ear, so I’m sure that I could find half a dozen of my previous statements that would back up my current position. Haters gon hate. The link song doesn’t sound nearly as much like Wilco as some of the ones on the other album you reviewed. On that album, Oregon Girl channels Jeff Tweedy. This one, not so much, and I don’t like it as much. They need to stick to the Wilco thing and just release albums in Wilco’s off years.